KALAMA’ULA, MOLOKA’I – Robin and Lisa Dudoit celebrated the beginning of construction on their new home earlier last week in Kalamaʻula, Molokaʻi. 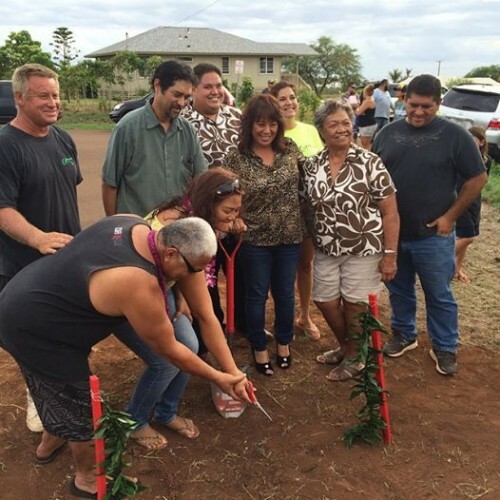 The Dudoit hale will be the first of its kind on Molokaʻi to utilize federal funds under the Native American Housing Assistance and Self-Determination Act or NAHASDA in a partnership with Habitat for Humanity Molokaʻi. Collaborating with Habitat requires the Dudoits complete sweat equity hours by taking part in the construction of their 3-bedroom, 2-bathroom home in Kalamaʻula Mauka. 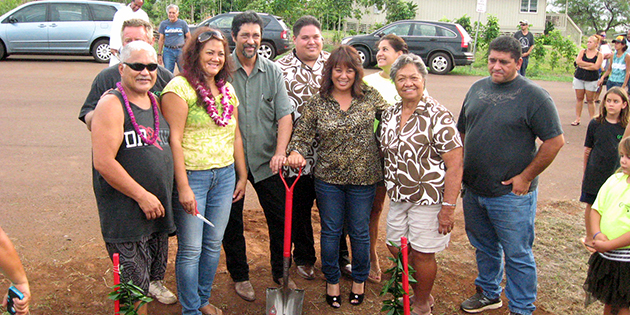 Molokaʻi Hawaiian Homes Commissioner Gene Ross Davis joined Zhantelle Dudoit, Executive Director of Habitat for Humanity Molokaʻi, and other Habitat and DHHL staff at the groundbreaking ceremony for the Dudoitʻs hale.